If you enjoy electric blues with a rock edge, there's nothing to dislike here. Joe Bonamassa's brand of energetic and authentic blues continues to keep his fans happy and win him new ones on a regular basis. 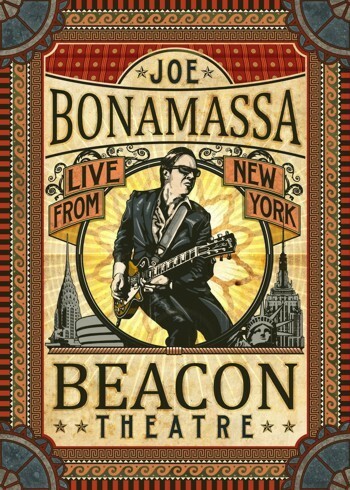 Now, Joe puts out a new live recording from the historic Beacon Theatre in New York. The opening sequence shows him dressed inconspicuously while he busks in the subway, before he takes the train to the Beacon, which is naturally packed to the rafters. Even more amusingly, the lavish booklet with the DVD set states despite his quite sublime playing, he didn't make one single dollar from his busking trip! Fear not, the performance on the DVD is somewhat higher calibre than your average busker! Unlike the Albert Hall DVD, which featured two drummers and a horns section, this show is more stripped down. Bonamassa retains the service of classy bass player Carmine Rojas and Rick Melick on keys, and has just one drummer this time: Tal Bergman. The band is superbly tight and rehearsed and Bonamassa leads them through many of his gems such as recent material like 'Dust Bowl' and 'Slow Train', alongside 'The River' and 'Mountain Time'. Joe also airs some of the covers he has recorded on his albums, such as a terrific rendition of Bobby Parker's 'Steal Your Heart Away' and a powerful version of Rory Gallagher's 'Cradle Rock'. As you would expect, Bonamassa's singing and playing is note perfect and his band underpin everything with precision and style. The cover versions don't end there; there are three guest appearances from other artists. Beth Hart comes on to deliver supremely soulful versions of Bobby Bland's 'Ill Take Care Of You' and Ray Charles' 'Sinners Prayer' from the album she did with Joe, 'Don't Explain'. Her powerhouse performance is very well received and adds an extra dimension to the proceedings. Secondly is John Hiatt, who joins Bonamassa for his songs 'Down Around My Place' and 'I Know A Place'. Hiatt plays acoustic guitar on the former before Joe brings the rest of the band in, and then they duet the latter. The final guest is Paul Rodgers, who delivers immaculate stagings of 'Fire And Water' and 'Walk In My Shadow' from his Free days. If you enjoy electric blues with a rock edge, there's nothing to dislike here. Everything about it oozes quality and it all comes to life via the production of workaholic Kevin Shirley. If you still aren't sold on it, there's a second disk of bonus material, offering you extra tracks such as 'If Heartaches Were Nickels' and 'Woke Up Dreaming'. There's also footage of Joe hanging out with David Crosby as they discuss alternate guitar tunings and generally talk shop, some extra footage of the busking that impressed the citizens of New York so much and a photo gallery. The whole package is superb and therefore essential for all existing fans of Bonamassa. Fans of any of the guests on the DVD would be well served checking it out too, as there is every chance they'll walk away fans of Joe also.